They were incredible!! They sounded perfect for the ceremony and reception, and they were very accommodating and helpful working with me - I was a little late figuring out the ceremony music and they were very patient and helpful. Several of our guests told us the wedding was amazing and that was in large part because of Trilogy! AMAZING BAND!!! We booked Trilogy for our wedding at the Detroit Athletic Club. They were excellent to work with and come highly recommended. My emails and calls were responded to immediately. The entertainment provided was wonderful as well. We chose to go with classic hits, Motown etc. They also DJ newer songs on their short breaks which was great. A lot of bridesmaids became extremely interactive with the band as the night went on and they were very welcoming and fun with that aspect as well. Again, I would highly recommend Trilogy!! Trilogy went above and beyond to make our special day remarkably special for us. Everyone at our wedding raved about the band and how they were able to entertain all walks of life. We had people from another wedding poking their heads in and grooving to their music outside the doors-- even the wait staff at our venue said they had never heard a band as good as Trilogy. Fabulous guys, extremely friendly, very talented- they were fabulous! Thank you, Trilogy, for making our wedding a huge hit! We hired Triology for our wedding and it was one of the best decisions we made. The band was amazing! The dinner music was extremely well done and not too loud so that our guests were able to carry on a conversation. After the meal the band got everyone involved by handing out tambourines and cowbells to the crowd and playing the music we had hoped for ('80s and oldies). We have received countless compliments on the band from friends and family. 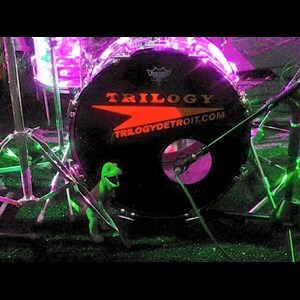 We are trying to come up with another reason for a party just so we can hire Trilogy again! I can't say enough good things about this band. People thought the D J was playing CD ,music when they first started they sounded so good. The Guy's were wonderful one of the best bands I've ever heard.Thank you so much for making my daughters party a hugh success. Ovid Carriage Days could not have choosen a better group to use this weekend. They really focus on the crowd and for the size community we are, you would have thought they had 1o,ooo people in the stands. Without ever saying a thing about what type of music we like, they had no problem pleasing the croud. We have had plenty of great talent at this festival but, their is no question in my mind that this group shoots right to the top of Ovid`s list. They definately will play in our festival again. P.S. Thank you for giving one of our residents a feel of his dream. Trilogy was a pleasure to work with. Everyone that attended my husband's 40th Birthday party reported loving the band. They have exceptional talent and appear very concerned about the audience enjoying the music! As we live in Columbus Ohio = Buckeye Nation, we were very impressed the Michigan based band did Hang on Sloopy for us! We loved it! I would highly recommend Trilogy if you want an excellent band sure to please at your event! Trilogy was awesome!!! They did a great job playing, and keeping the party going all night long. Only reservation was the bride and groom had to provide the songs for special dances/ key events and requested music in between sets. This is a very talented group however, with the know how to keep the event running smoothly and fun. Overall, we'd both highly recommend this band for your next event with the one minor reservation. Trilogy was GREAT! Our friends loved them, great music, great musicians and an all around great time for all! Thanks for getting my husband to sing - he loves singing with musicians and was unusually shy that night - must have been overwhelmed by the surprise party. We enjoyed the Trilogy band that played at our 7/08 Birthday party. The performance was enjoyed by all. The music enticed our party goers to get up on their feet. We would recommend them highly. Trilogy were very very good! Very accommodating, learned a lot of songs specifically for this event. They did not have an issue of being too loud, which is very common with live bands. They catered to all guests interests and knew just what songs to keep things hopping! An amazing band with great talent.